by Zheng Shibo KABANJAHE, Indonesia, Feb. 4 (Xinhua/ Sun) -- The eruption of Mount Sinabung in the western island of Sumatra that started in September last year has already killed 15 people and forced the evacuation of more than 30,000 local villagers within a 5- kilometer exclusion zone around the volcano's crater. The volcano has continued to spew huge columns of ash for months but now the villagers are still optimistic that their ordeal would end soon and that they would be able to return to their villages and resume their farming and other forms of livelihood. At the evacuation center set up at Mesjid Agung, the biggest mosque in Kabanjahe, a small town 12 km southeast of Sinabung's crater, villagers are finding ways to keep themselves busy despite their worries about their homes and animals. Mesjid Agung, one of Sinabung's 43 evacuation centers has some 700 evacuees. Here everyone greets strangers with a smile and it seems they do not have complaints about their current condition. In fact, the men at Mesjid Agung have painted the fence in front of the mosque, cleaned the drainage system and repaired surrounding roads while women cooked food, knitted and taught their children who have been forced to temporarily stop schooling because of the eruption. The kids seemed not to mind the inconvenience in the evacuation center since they continued to play and have fun. Anas Sinulingga, a villager from Dusun Laukawar which lies 3 km from the crater, said he and his family have lived at the center for four months already. He said he is now used to living in the center although he hoped that the eruption would soon stop so that they could return to their village. Anas's crops, including his oranges, were all damaged by the ash fall. "This is all God's intention and I will accept it," the 43- year-old Anas said with a smile. A religious person, Anas said that what happened to them is a test of their faith in the God, adding that the merciful God would surely reward them for their strong belief and would return everything that they have lost. Rapendi Tarigan, a villager from Beras Tepu, which is 4 km from the crater, said he will always try to look forward and never give up despite the continued shower of ash and pebbles that have destroyed his house and killed his livestock. "We have to keep smiling, what else can we do?" Rapendi said. 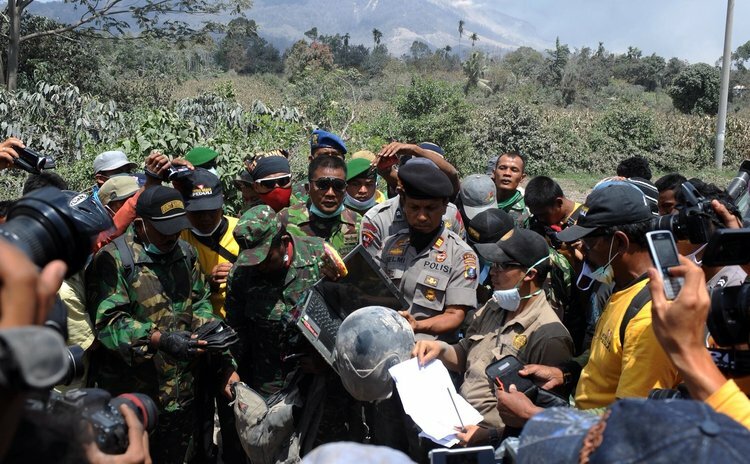 "There is no reason Sinabung villagers could not overcome the difficulties brought about by the eruption in the same manner that the people of Aceh survived the 2004 tsunami," he added. Rapendi said he is hopeful that President Susilo Yudhoyono would keep his promise to build houses for them and that the government will help them to rebuild their lives.